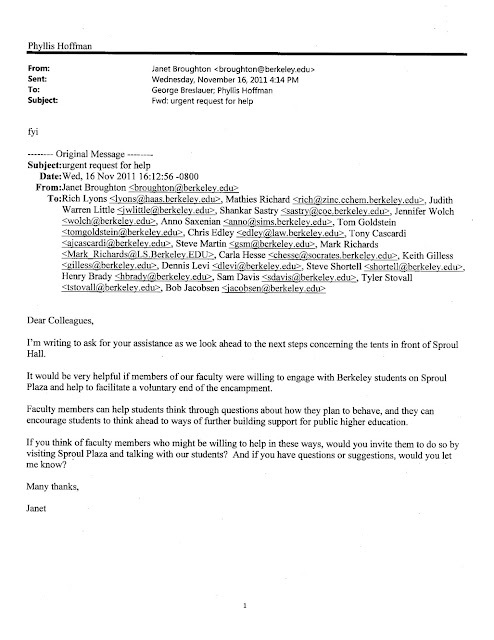 Yesterday we posted some of the administration's emails regarding UCPD's brutal attack on the #occupycal encampment on November 9. In these emails, Chancellor Birgeneau, who was out of the country at the time, is notified of what happened, and responds that the violence is "unfortunate" but necessary. 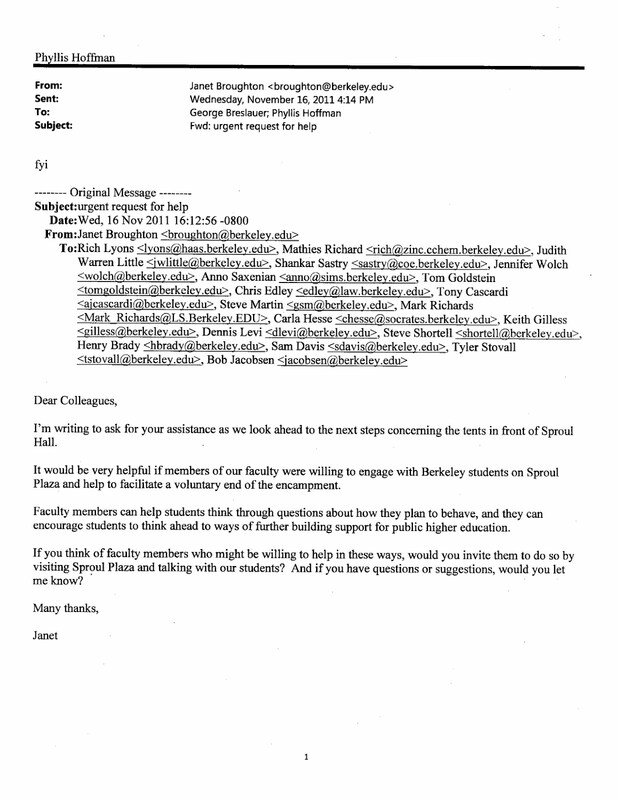 "Obviously," he wrote to Executive Vice Chancellor and Provost George Breslauer, "this group want [sic] exactly such a confrontation." Later, Birgeneau wrote again to Breslauer, declaring that upholding the university's encampment policies at any cost was essential: "Otherwise, we will end up in Quan land." Many professors, believing themselves to be the beneficiaries of privatization (in the form of grants, donations, endowed positions, etc. ), support Katehi’s agenda. Now we know that at least 343 of them support enforcing privatization by violent means. This is useful knowledge. We also know that “only 37% of UC Davis faculty vote on measures regarding campus events that received worldwide attention.” And professors complain about student apathy. Those professors who brought forward the motions of no confidence and against police violence should be applauded. It’s risky to speak out when promotion and tenure depend on toeing the line. It’s encouraging to note that 312 professors support their students. But these motions highlight the limits of institutional struggle (petitions, motions, declarations), where the administrators will always have the upper hand. They write the rules, and circumvent them when necessary. For years, faculty have fought a losing battle to defend shared governance, tenure-line positions, and academic freedom from a rapacious administrative logic. It’s time to abandon institutional forms of defense and turn the tables on the admins. Solidarity means attack. We don't know what the results of this fishing expedition were. What seems important here is the fact that the administration sees the faculty as (at least potentially) an ally instead of an adversary. Not only that, but it is clear that if professors were to show up to the encampment, and were to try to talk the students into leaving -- in the administration's words, if they were to "help to facilitate a voluntary end to the encampment" -- they would be doing the work of the administration. This is not to say that these professors would literally have conspired with the administration but rather that they would be furthering the administration's goals -- the constant de-escalation, displacement, bureaucratization, channeling organizing energy away from the antagonistic administration and into vague efforts to "further build support for public higher education." If de-escalation is the administration's goal, direct action is the only alternative. We join with our comrades from Davis in calling for the faculty to reject institutional forms of struggle -- which are inevitably coopted and recuperated -- and join with students and workers in shutting down this university. "We don't know what the results of this fishing expedition were. " Not sure if that's an outcome of that e-mail, but Humanities Dean Carla Hesse was at OccupyCal fairly often lecturing students about what was or wasn't non-violent.